You might have already heard about the ‘Derma Roller Treatment’ and its amazing benefits. But if you are still wondering what the treatment is all about, worry not! We’ve got you covered in this article. Let’s discuss everything about the treatment so that you can make a wise decision. What Is The ‘Derma Roller Treatment’? The ‘Derma Roller Treatment’, also known as ‘dermarolling’ or ‘microneedling’, is a cosmetic procedure in which thousands of tiny needles or ‘microneedles’ present on the surface of a device called ‘dermaroller’ are inserted into the surface of the skin to stimulate it. The device is rolled across the skin in a controlled manner so that it can reach all parts of the skin seamlessly. The process may seem terrifying as the needles result in the formation of many little injuries all over the skin. However, it is known to be ‘minimally invasive’ with ‘little to no downtime’. What Is A ‘Derma Roller’? A ‘dermaroller’ is a rolling or stamping device, which comes with thousands of tiny needles encapsulated on its surface. The needles can be made of either titanium or stainless steel. While titanium needles are strong and durable, they are not enough sterile and hence, need to be cleaned pretty often. Conversely, stainless steel needles get blunt more quickly though they are inherently more sterile. It is always better to go with the steel-made needles to maintain better hygiene and it is also considered as professionals’ choice. 2.0mm-2.5mm: Enlarged pores (used only by professionals while performing the treatment under topical anesthesia. 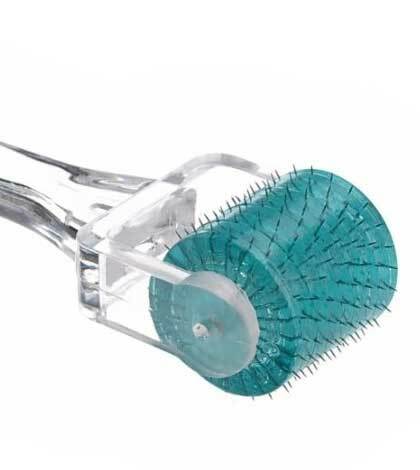 How Is The Derma Roller Used? Start by disinfecting your derma roller properly. Also, wash the skin (on which you are going to use the device) thoroughly with a mild, pH-balanced cleanser. Apply an ‘anesthetic cream’ or numbing cream based on the thickness of needle you will use as well as your own pain tolerance level. Now, start dermarolling. Roll the device across your skin in one direction (say, vertically), lift it up, and repeat for 6 to 8 times in the same direction. Move the device over the skin a little and roll it again for 6 to 8 times just like the previous way. Keep repeating until that particular section of the skin is rolled completely in one specific direction. Then, go back over the area of the skin from where you started and repeat the previous step by moving the derma roller in the perpendicular direction. Cover the entire skin again this way. Once you are done with it, wash your skin with plain water. Also, clean and disinfect your derma roller nicely. The derma roller treatment creates ‘microscopic injuries’ and the skin starts producing excess collagen to heal those wounds. Collagen is a kind of protein that holds the connective tissues in our body together, thereby making us look fresh, rejuvenated, and youthful. As it induces collagen production in the skin artificially, it is also given the name ‘collagen induction therapy’. Some of the immediate results of dermarolling include redness, minor swelling, slight burning sensation, pulsing sensation, peeling of skin, etc. These will subside in 2-3 days automatically. A derma roller, if used the right way, can actually work and offer tons of benefits. As a result of excess collagen, the skin automatically looks plumped up. This helps in erasing wrinkles, fine lines, acne marks, stretch marks, skin discoloration, etc. while filling up scars, cellulite marks, etc. and increasing the thickness of the skin. The ‘poking’ action also improves blood circulation throughout the skin, thus making it rejuvenated and naturally glowing. The treatment also opens up the pores to make the skin more receptive to any product applied to it. The derma roller treatment does not promise an overnight success. You can see minor improvements in a couple of weeks while substantial progress will be visible within a few months. Is The Derma Roller Treatment Safe? There are chances of infection if you do not sterilize the needles after each use. Make sure that you follow the pre and post-care guidelines correctly. Buy only the best quality device since fake or low-quality ones can cause damage to your skin. Very thick needles can also end up damaging your skin. So, start with the thinnest one and determine your tolerance level first. If your skin is hyperactive and breaks out regularly, do not use derma roller as it can spread the bacteria and cause damages. It is always advised not to overdo dermarolling and do a patch test to see how your skin responds to the treatment before proceeding with it. If you are using the derma roller on your face, splitting it into multiple sections may make your job much easier. But make sure that you skip the areas around your eye sockets. Rolling the device diagonally will create more stress on the center of your face due to uneven pattern distribution. Better to avoid it, or be extra careful. Do not put too much pressure while rolling the device on your skin as it will be very painful for your and the injuries will take more time to heal. Make sure that you lift the derma roller up after each roll in order to prevent the appearance of ‘track marks’. You can decrease the number of rolling in one direction based on the sensitivity and pain tolerance level of your skin. After dermarolling your skin, you must not treat it with chemical exfoliating agents or other skincare products containing benzoyl peroxide, salicylic acid, tretinoin etc. Never treat your skin more than twice a week and give it enough time to heal before undergoing another session.